If you’re thinking of selling a timeshare, the FTC cautions you to question resellers — real estate brokers and agents who specialize in reselling timeshares. They may claim that the market in your area is “hot” and that they’re overwhelmed with buyer requests. Some may even say that they have buyers ready to purchase your timeshare, or promise to sell your timeshare within a specific time. All they need is an upfront fee to get the ball rolling. Well, hold onto your money and read on. Today, the FTC is charging the operators of a timeshare reselling scheme with bilking at least $15 million from timeshare owners by charging upfront fees of as much as $2,500 — or more — with promises they would rent or sell the properties. As time passed, the defendants would ask owners for more money, claiming the sale was about to take place and even characterizing the additional fees as closing costs. When the promises weren’t kept, consumer requests for refunds were routinely denied or ignored. Not anymore. At the FTC’s request, a federal court has temporarily halted the operation while the FTC seeks to permanently stop the illegal practices and get money back for consumers. 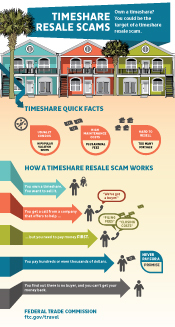 For more information, see buying and selling a timeshare, or check out our infographic to see how timeshare resale scams typically work. You can help the FTC by reporting at FTC.gov/complaint. The information you give will go into a secure database that the FTC and other law enforcement agencies use for investigations. The comments you put here on the blog don't go into the secure law enforcement database. I have read all the blogs. I did not find any bonafide contact path for help. I also did find any reference to a legitimate case filed leading to a legitimate conclusion. I’ve been barraged by emails and phone calls from Travel Plus and now the Closing Source. Apparently, there is 33,000$ sitting in an account just waiting for me to claim it. They’ve gone so far as to send me a contract signed by all parties, and they are waiting on my signature- which is not going to come. I’m curious to know if anyone else has gone further with these companies. I was contacted by these people and sent a contract. Haven't gone any further, waiting on someone who has actually gotten money from the sale of their timeshare. Anyone ? Also been contacted, by Travel Plus Ac, said they would send contract for my attorney to approve. Hmm we wil see if legit. I received the contract from Closing Source and passed it to my lawyer and we checked that too. He did his research and told me that the cease and desist letter is for them to stop providing title insurance but my lawyer says that they don’t provide title insurance so I don’t think it’s a scam. Out of nowhere received a call from TRAVEL PLUS using a company called CLOSING SOURCE LLC to purchase our timeshare in MX for a very attractive sum. Told them I would need more time for our attorney to review their contract and that I would be checking these two entities out further. Advised them today "NOT INTERESTED" nor do I believe in their conspiracy. Of course have not heard back from them since last communication 4 days ago. People are just amazing and really do not see how they present themselves in a shading, yet conspicuous manner trying to take advantage of good people. McfQueens......we received same invitation from these two scammers. Told them to take a hike. I have a similar story to most. Contracts and paper trail appear to be legitimate. Business license and broker license numbers check-out with the state of NY. They're requiring a RFC (tax ID #) to be obtained, Mexico state tax to be paid until my funds can be released. Very skeptical. Has anyone heard of Golden Asia Realty or Nations Capital Title Services??? Help please. I am in the same boat, how did you make out? I have been contacted by Golden Asia Reality as well. Nothing has gone through yet but I have been doing research on permits or other procedures when selling timeshare in Mexico. There is only a transfer document and transfer fee needed, no taxes or permit. Timeshare is not consider real estate property therefore there is no permits for foreigners to buy. Also, I was told that all fees can be taken from the sale as well no money up front. I am curious to find out what happen with your case. "Getaway travelers Inc" is using "Escrow Holding Management" to offer 2 1/2 X what I paid 3 years ago for a time share ("Unlimited Vacation Club"). All looks very professional until they needed $4000 to get registered with Mexican government. I will be cancelling the contract after I have some fun stringing them along. Has anyone heard of Twin Cities Brokerage? I believe they are scamming my grandpa. He is too trusting and just lost thousands. The FTC has tips about selling a timeshare. You can contact the state Attorney General and local consumer protection agencies in the state where the reseller is located. Ask if any there are complaints on file. Search online for complaints about the company, by typing the company name and the word "complaint" or "review." Your grandfather can report the money lost to the FTC at FTC.gov/complaint. The information you provide will go into a secure database that the FTC and other law enforcement agencies use for investigations. He can also report to your Attorney General and to the Attorney General in the business' home state. I am in the same boat, I would like to know how you ended up with this good or bad? Because I know they make you sign a contract and did they try to enforce it if you did not send money. They are back...scammers telling me they can recover the money I lost in the last timeshare scam in 2012. Call from out of the blue from some so-called Mexican bank official representing people who lost money in scams with Villa del Palmar. Said he'd represent my claim. I told him I lost $15K. He came back with an award for $21,575.45. Now all I need to do is set up some bank account in Mx so the money can be wire transferred from there to my local bank account. I may have been stupid before but this is too much like the last time. Beware of Santiago Robles Gomez of Condusef working with Mario Luna of Indeval. Using internet ids like contacto @pbi. com. mx. Beware of phone numbers like 525585262083 or 525541696213. Fortunately I haven't fallen for the scam because if it's too good to be true, it is a scam. Has anyone heard of Premier Consulting LLC in Corona, CA? Are they legit or is it a scam? Did you ever find out about them? We were contacted by Travel Plus AC that they had a buyer ready to purchase. Contract states no monies upfront, only commission out of sale proceeds. Right before closing, Closing Source LLC wanted us to send $4250 a tax, since we were considered investors. Travel Plus and Closing Source LLC wanted us to sign addendum to contract to allow them to charge the $4250. We didn't and up to today they keep calling asking why we wouldn't do it. Want a letter of cancellation from us or they will make sure that we lose our time share. Haven't done anything further with them. It's a SCAM!! Contacted yesterday from Whittier Real Estate in L.A. Said they had a buyer for my Presidential Suite at Pueblo Bonito Sunset Beach for $55,900. Our mouths dropped open at the price - too good to be true. They sent an initial email for us to sign saying we were interested. The "agent " said he would call back today. When I call this supposedly big company there is only an answering machine. It was good to read all of these comments to confirm this is a scam. Stay away from Jack Duffy, Duffy Management, Karen, Orrin Reynolds, Assurance Title & Trust and other co-conspirators - they have no consciences! They offer to re-sell your timeshare and string you along very convincingly with a well-devised scheme. Same boat, contacted by First Brokers Inc and Accurate Tittle and Escrow from Alabama, BIG SCAM!!! wire couple of transfers for closing and other fees. They had a buyer for my timeshare in Mexico. Be aware of these people. I wire to a Broker in Mexico more than $10,000. Now they are treating me to take to court for breaching the contract. So I just received an offer from San Diego Dynamics. They have a buyer ready to buy property from my Villa Del Palmar timeshare in Cancun. They apparently already have the funds in a Citibanamex account but I need to purchase a RFC for ($3000) so that I will not be double taxed by the mexican govt for capital gains. Has anyone else had any dealing with this company. I think this is happening to me right now..just got an email stating I need to pay up front 3,770 to Mexican govt to release a tax lien on the vacation plan...of course I will get it back at escrow... from this blog doesn't sound promising... has anyone tried to cancel the contract? Says they have a corporation wanting to buy timeshares for corporation travel. I have also been contacted by Wonderful Realty Corp to sell my timeshare. Did you find out if they are legit? Has anyone dealt with First Property of Newyork and 1913 Capital Group LLC,( Escrow) . Im skeptical about the company since I cant even verify the address of this company. I have also been contacted by Wonderful Realty Corp, Flushing, NY about selling my timeshare. So far the person I've spoken with is courteous and seems upfront. I would like to know if this is a scam, will wait to see what happens. I'm very wary after getting hundreds of calls similar to this. However, I am willing to take this one step further to see what comes up. They say they get paid commission after the sale only, no $ up front. I got a call yesterday and today from Daniel Reese of Wonderful Realty. I Googled the address and it looks dodgy. There's been a lot of calls lately. Last week, it was from a company called Bedbookers. Why is there a surge of these calls wanting to purchase timeshares? Has anyone heard of TheConsultants Firm International in Colorado Springs? I was about to go forward until they needed a wire to a Mexican holding company associated with Diversified Investment Holdings, Inc., in Colorado Springs for $3250 for a Mexican Foreign Transaction fee they claimed just came up to pay up front and to be reimbursed at closing in a quick amount of time, less then 30 days. I am not comfortable paying up front, that is what escrow is for dividing up the funds and closing costs. Legca can you tell me the names of the people that contacted you from TCFI and DIH. Hi LEGCA: Did you finally proceed with this? I am on the same situation of you. I was contacted by The Consultants International firm and Diversified Investment Holding. I have tried to check if this is a scam or not, but I am far far away from USA so it turns into a really difficult task. I am almost sure to proceed, but not 100%. Read about selling your timeshare through a reseller. We've recently been contacted by Wonderful Realty Corp too. The offer from their "buyer" is too good to be true. Their website looks somewhat legit but the address seems to be a residence and I can't find ANYTHING else out about them until I stumbled on this thread. Has anyone used,or heard of PNA Marketing out of Los Angeles , CA. Timeshare. After questioning them about the the legitimacy of their business and telling them I would not send any taxes or fees in advance, they quickly ended the call saying they would, with in the hour, send me information to prove they were legit. Have not heard from them since. Just received a call from Wonderful Realty as well. He will be sending me information. I'll see what happens. I received a call from George Galas at Wonderful Realty Corp. several weeks ago (around mid-February). After some correspondence, via email and phone calls, I gave them my timeshare details and received a "Proposal" to purchase my Resort membership in Cancun, Mexico. I signed it, acknowledging that it was not legally binding, letting them know I would like to proceed, and emailed it back. Next I received an email from Matthew Cabrera, Head Escrow Officer with Asset Advantage, LLC. He sent me a "Presentation Letter" and a "Trust Account Application." The application is to a bank in Mexico City, MX called CitibanAmex. It is asking for general information, including my Identification number, which I assume means my SSN . I haven't completed the Application yet, but I assume that the "catch" is that the Mexican government will need to receive a tax payment before they can release the money from Wonderful Realty Corp. in the Trust! I have been down that road before (with a different company) and sent some money, and then was repeatedly asked to send more money. I don't know if that is what Wonderful Realty Corp will do, but I will see what happens next and find out if they are a scam! So, I was contacted by Wonderful Realty as well. Has anyone had an outcome yet? All of the above has happened to me and now I'm felling pretty screwed. I really hope this is not a scam. I am wondering if anyone out there has had any dealings with Universal Realty Plus or AAA management both in NYC for selling a time share in Mexico? Can you bequeath the timeshare in a will to the developer, or to some person overseas?